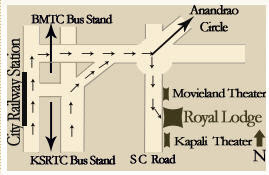 Royal Regency Lodge is conveniently located in the heart of Bangalore City. Situated within walking distance of many Bangalore’s local attractions, this lodge is a great choice for either the business or leisure travelers. Guest will find this hotel convenient to the city’s local transports like, the City’s bus station and the City’s Railway Station. Running hot water in the morning. In House Laundry /Dry Cleaning. Direct Dial phone lines in the rooms. 24 hours house keeping/ room service. Double occupancy room with T.V, Phone.